Spring is finally here! Pastels are in, ultra violet is trending, and greenery is finally in bloom! To celebrate our 35th anniversary, we want to share with you 35 spring weddings that we are swooning over! Spring weddings are refreshing after cool and gloomy winter. 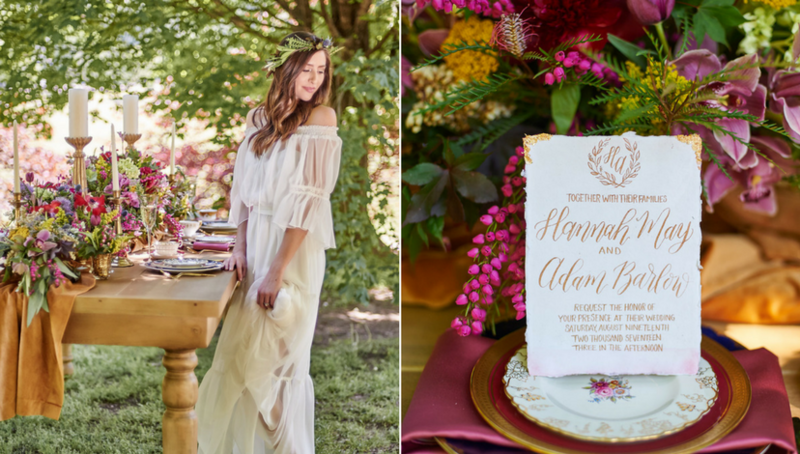 These upcoming looks are some of our favorite by the way they’ve embraced the season and used décor to exemplify that spring has arrived! 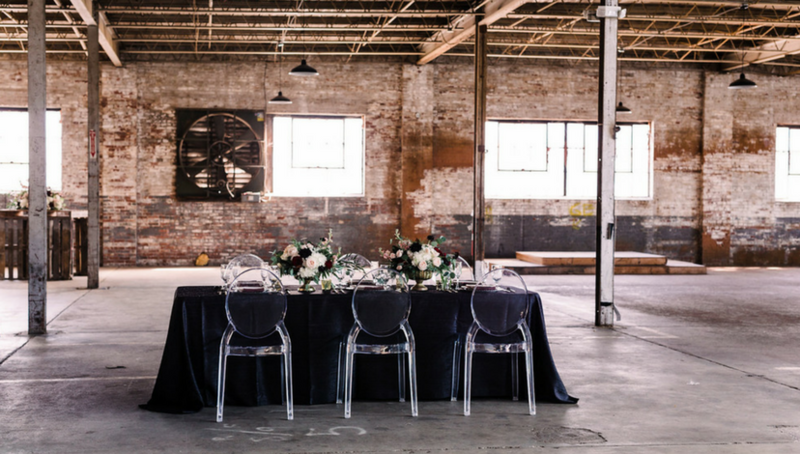 A warehouse venue it a blank slate to any event style. 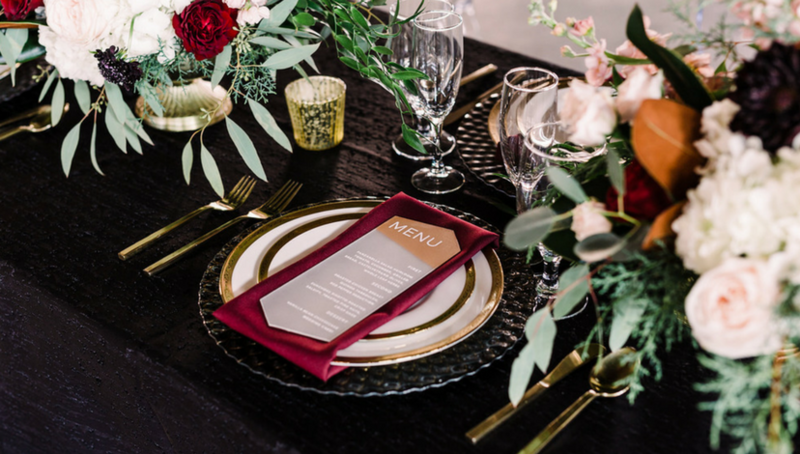 While most spring looks include bright colors and pastels, the dark linen paired with blooming florals creates an upscale look worthy of falling in love with. Romantic and bold, this look give you all the feels that spring is in full bloom. 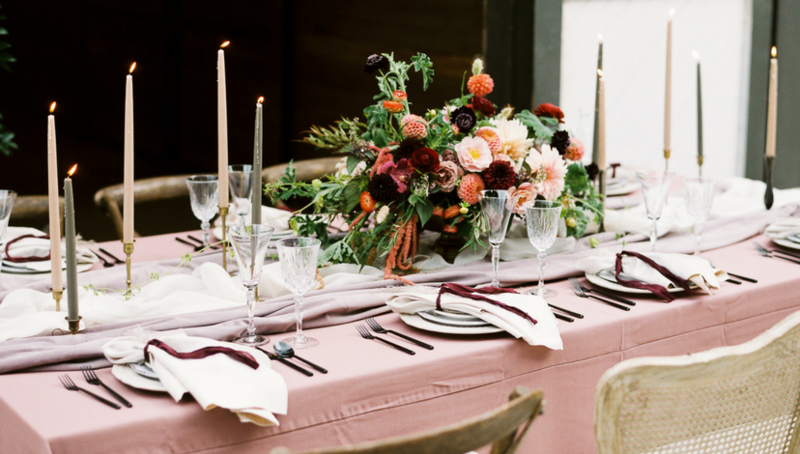 Any tablescape full of fresh florals brings life to the entire look. This look is nothing short of refreshing. Velvet linen brings a comforting feel to the table while fresh greenery adds the perfect touch of spring. What better way to celebrate the season than including life itself! Fresh florals, hanging limbs, and decorative plants bring nature straight to the table. No table is complete without personal touches. The coordination of the charges and decorative china make the bright florals pop even more. It’s no secret that velvet is a the perfect touch for any spring event. A combination of blues may look icy and cool, but brings a sense of warmth to this spring spread. A neutral linen doesn’t have to be plain. 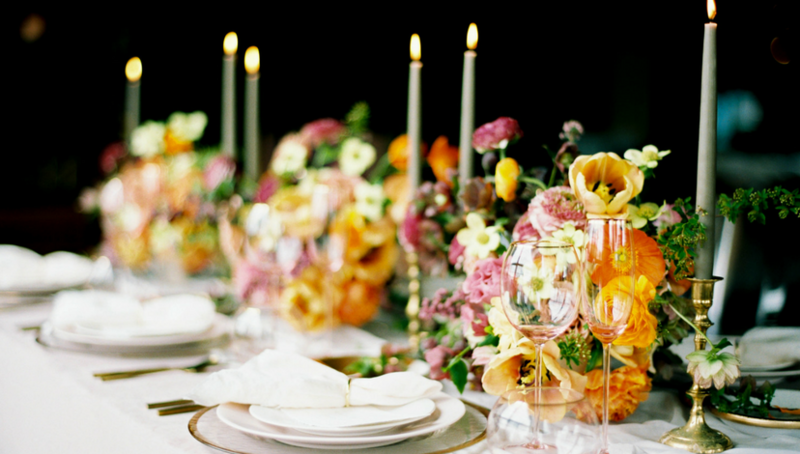 Paired with bright, warm florals and tall black candles, this look is inviting and warm. 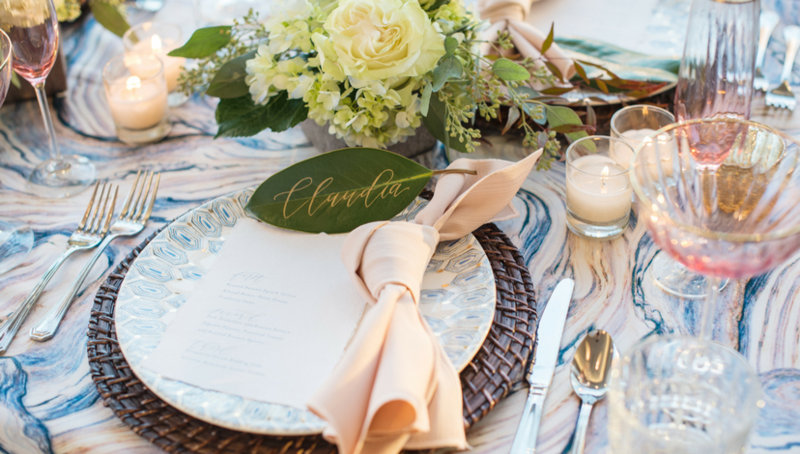 Every wedding’s style comes through in the tablescape and décor. 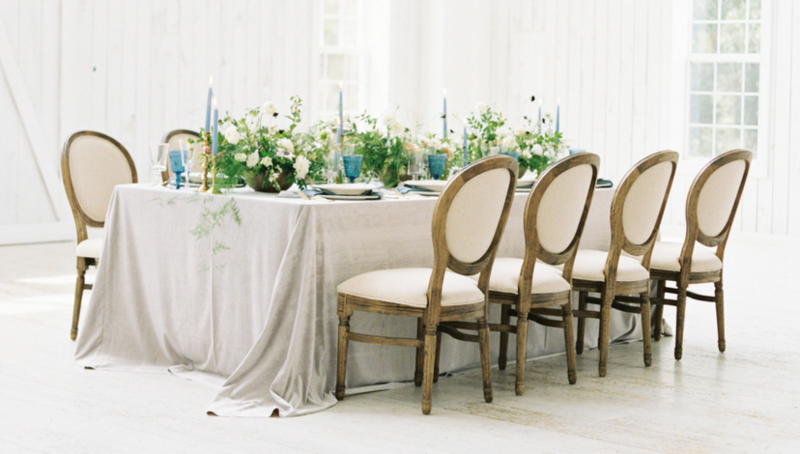 With spring in mind, these tablescapes took the trophy for expressing the true meaning of spring. Add an unexpected pop of color to your tablescapes with a cherry red. These chargers make a big impact by tying in the red roses and candles with this bold theme. 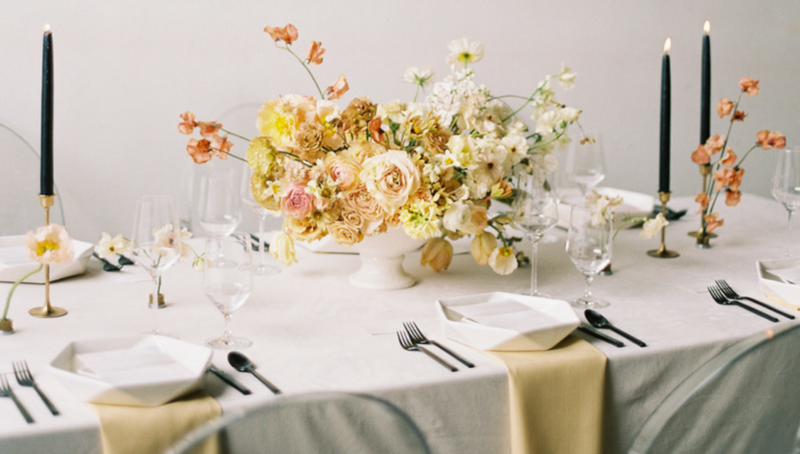 Spring tablescapes aren’t complete without plenty of spring flowers! Throw in some table candle holders encased in glass and you have the perfect romantic settings for any spring wedding. 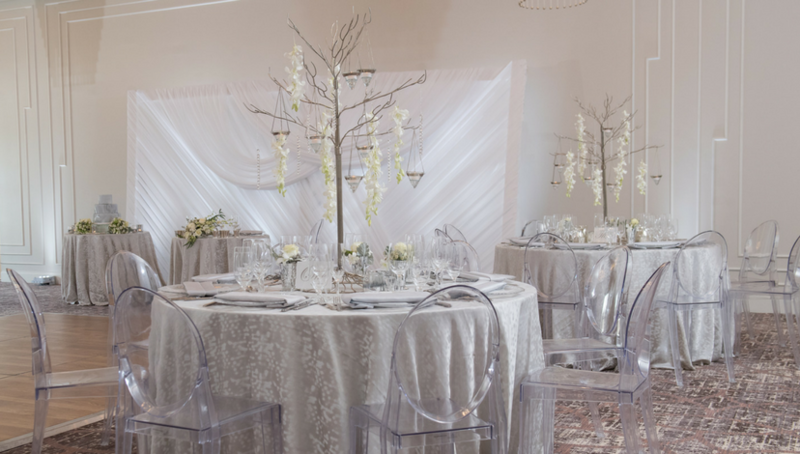 Nothing screams modern more than silver linen and acrylic ghost chairs. 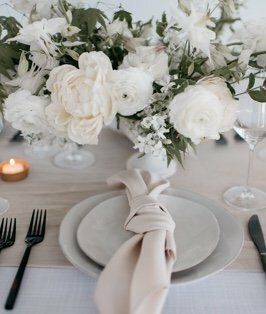 With a touch of nature from the branch centerpieces, this tablescape creates a harmonious balance between modern and timeless. 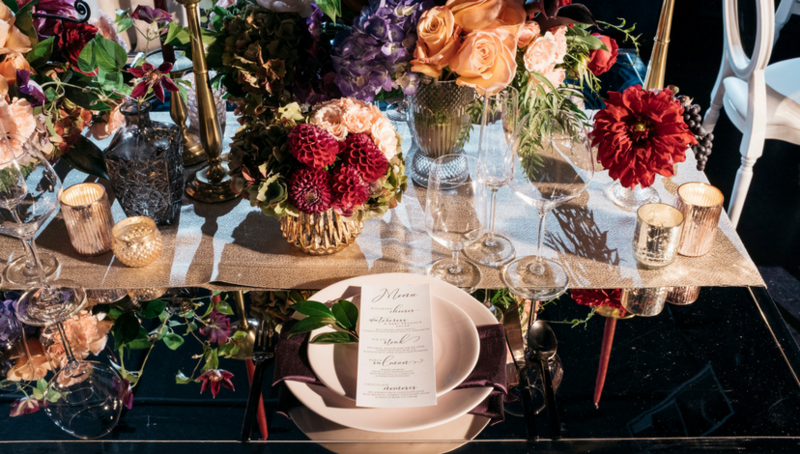 Dark linen and chargers with contrasting burgundy napkins adds drama without overshadowing the bright white blooms. 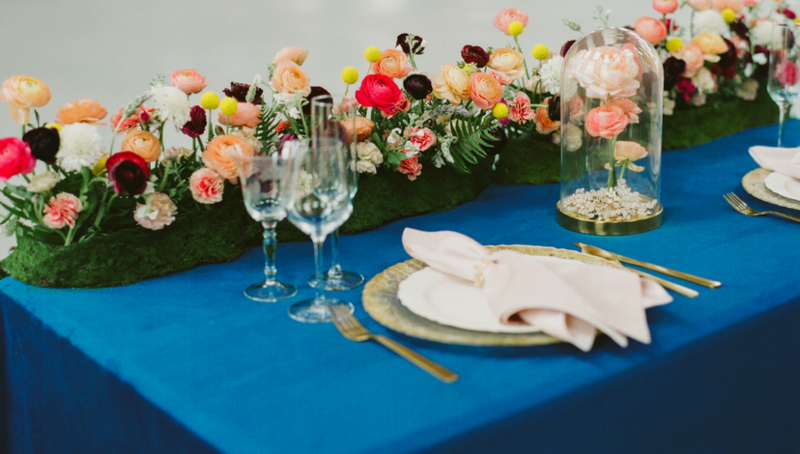 This color palette is made for brides who dare to defy typical light and bright spring weddings. 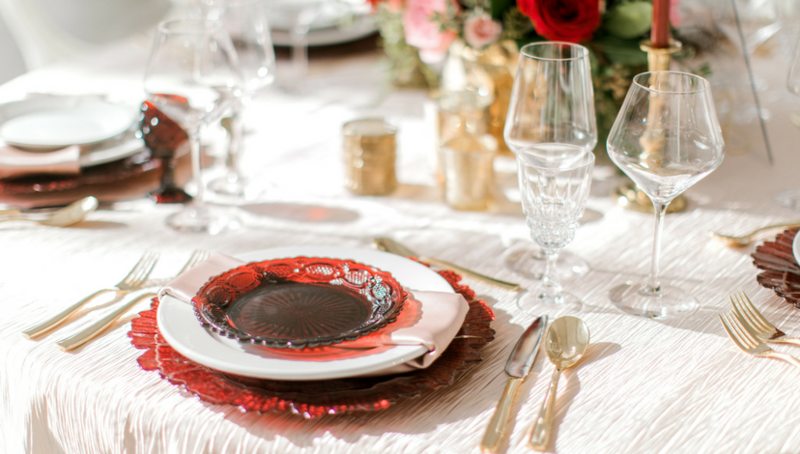 Deep and romantic, we can’t take our eyes off this red tablescape! 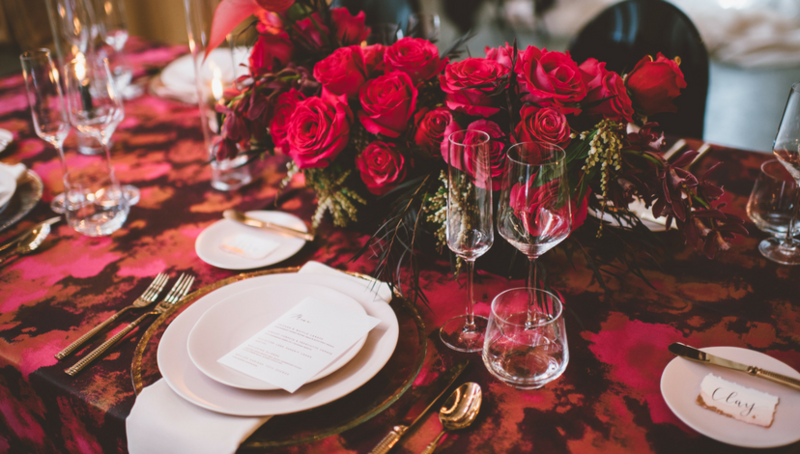 Classic red roses are a bold choice for a spring wedding, making this ravishing look one of our faves. 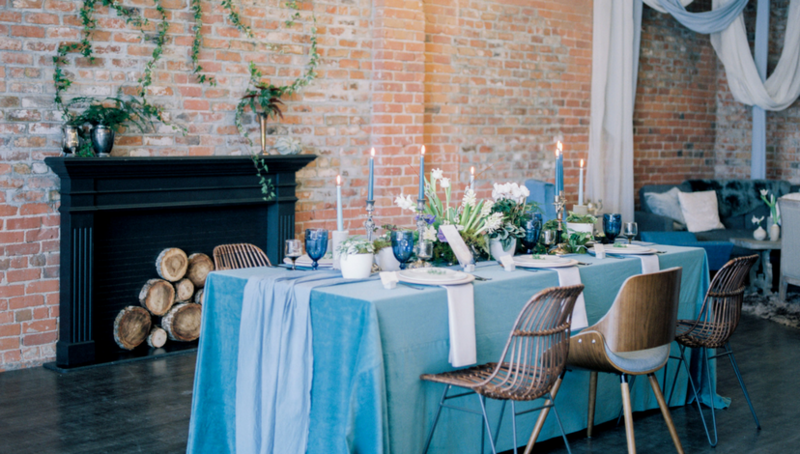 Anchoring this tablescape, greenery and florals add a strong focal point for this bold blue linen choice. It’s definitely giving us garden goals! Towering candle sticks and centerpieces add a timeless modern look to this otherwise delicate blush table design. Add in a few agate place cards and you have yourself one stylish party! Spring weddings and events call for al fresco dining. This Spanish-inspired table captures the beauty of spring blooms while maintaining structure with blue china plates and black candles and chairs. With its organic blue veining, Azure Agate has become a favorite for setting the tone for modern soirees to laid-back shindigs. 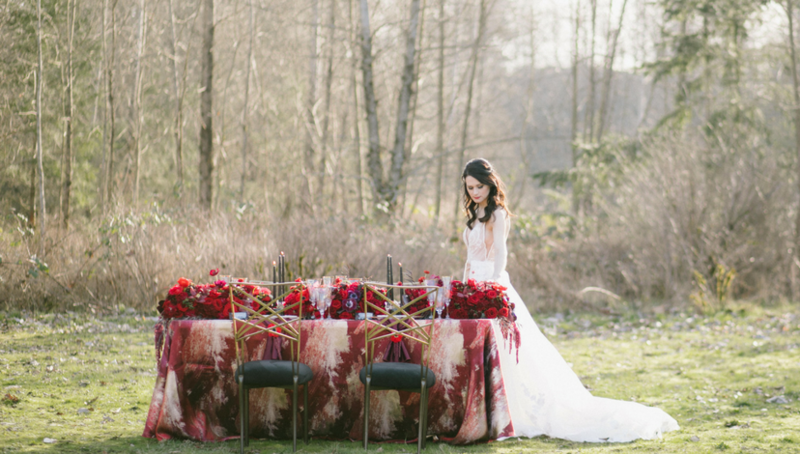 This particular design looks like it’s been taken right out of a scene in nature and plopped onto the tabletop, we’re obsessed! Now this is one way to highlight your beautiful spring flowers. 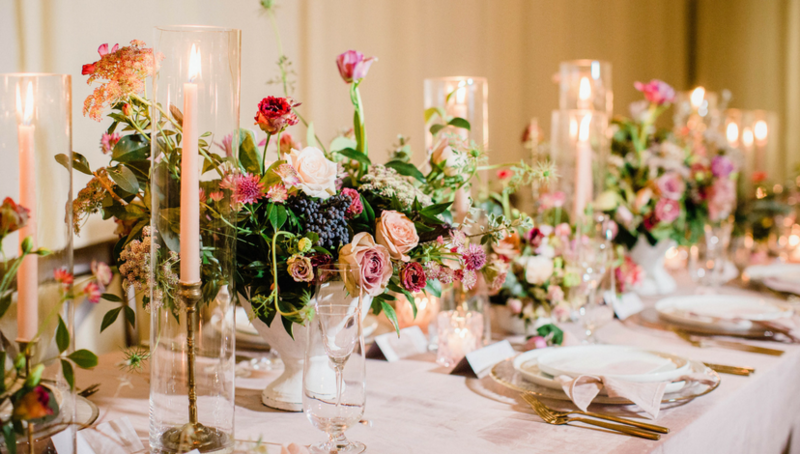 Instead of one big floral arrangement, the designer opted for several smaller arrangements, creating beautiful vignettes all through the table. 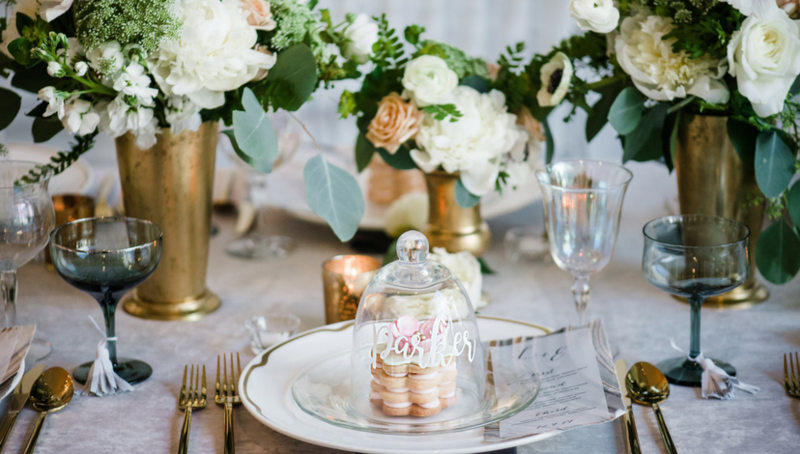 We love this place card idea of a small treat enclosed in the cutest glass cloche! Why not give your guests a pre-dinner snack? Trust us when we say your guests are definitely going to appreciate this sweet surprise. 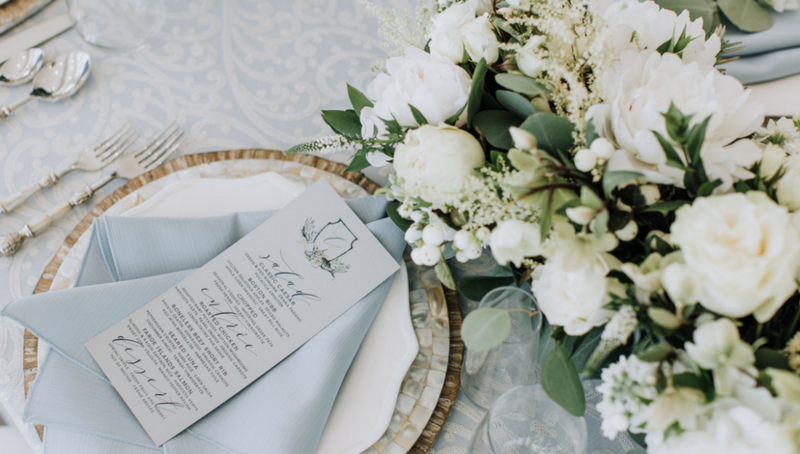 Shi Shi Events | Jenny Haas Photography | Baker Creek Farm | Molly Taylor and Co.
Don’t settle for one table runner when you can have two! Layer a soft sheer runner over a luxe velvet runner for twice the fun. This design isn’t afraid to play with textures and add depth to the table. 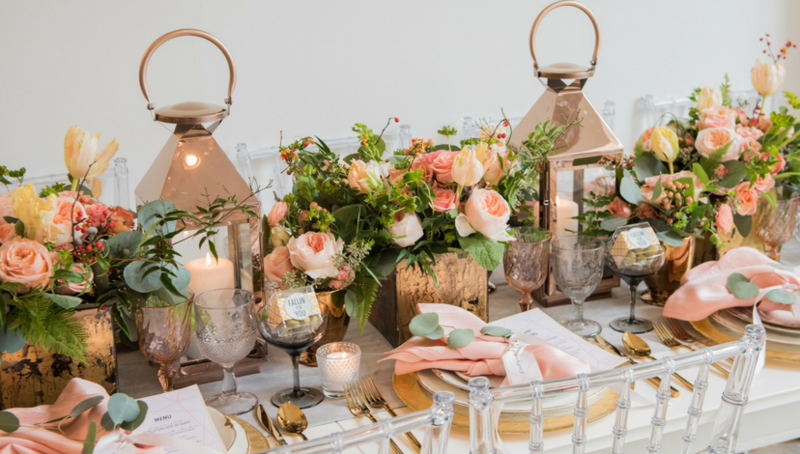 Give your wedding an ultra romantic look with rose gold accents and warm peach tones! Peach is a great alternative to pink and gives an unexpected fresh twist springtime events. Sky blue has never looked so good. Pair soft blues with lacy white details for a match made in heaven! We can’t get enough of this seaside look. Highlight the spirit of spring with bright warm tone florals. 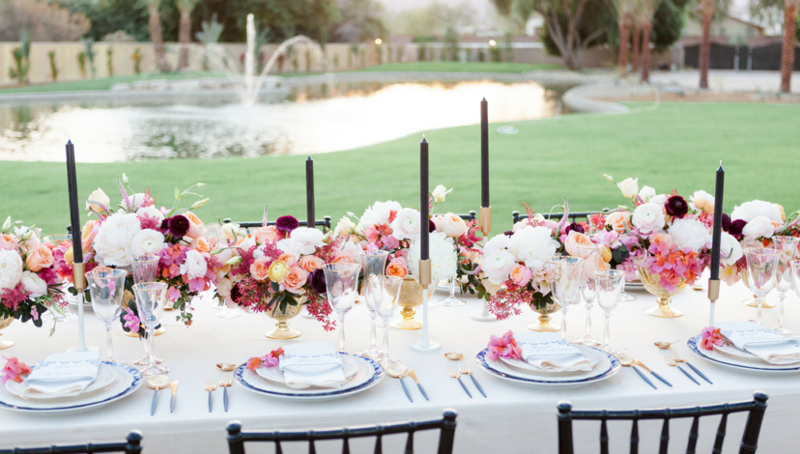 Pinks, yellows, and oranges pack a punch to this white linen tablescape. Let’s take a moment to appreciate all the textures happening in this tablescape. From the sequin table runner, to the wood grain table, to the sparkling lines on the chargers, this design epitomizes chicness! No wedding is set without some sweet. Spring patterns contain greenery and pastels. 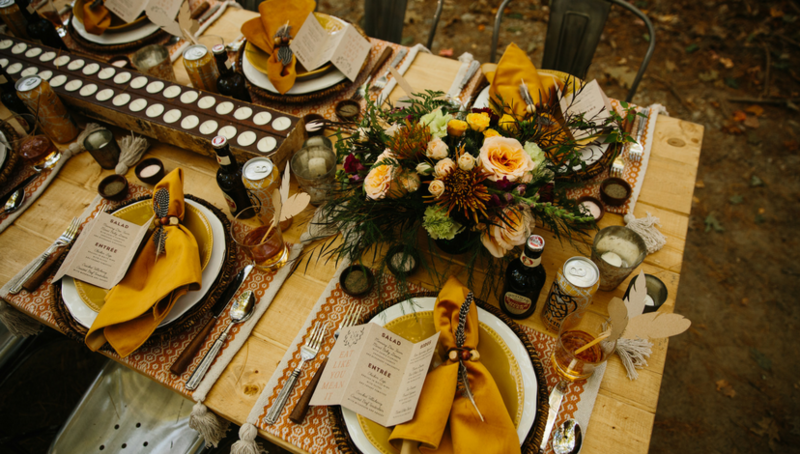 These sweet tables brought their A game. 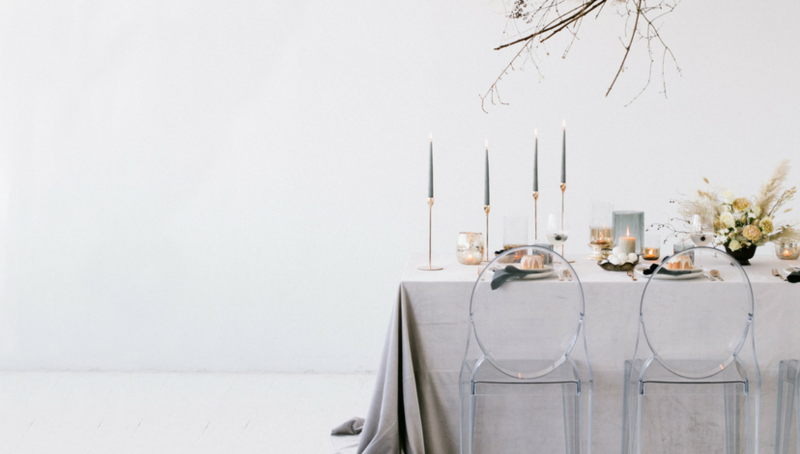 We love how neutral table linen creates the perfect base to build on for any sweets table. 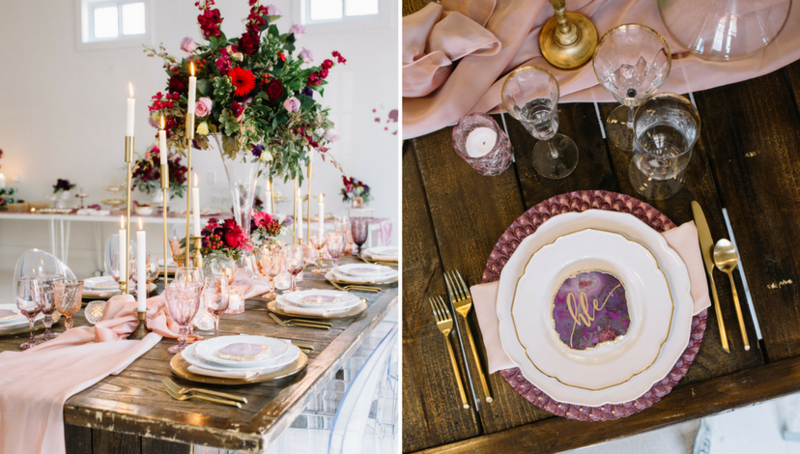 Velvet gives this table an elevated look with balancing the pops of pinks, red, and greenery. Make it trendy with this fabulous marble pattern table grounded by silver chrome accents and white florals. 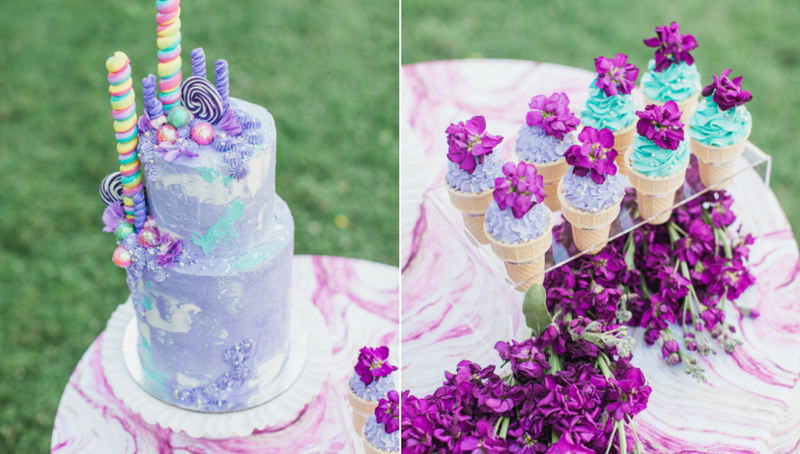 Give off major unicorn vibes from this magical sweets spread of cake and candy. These bright swirling colors make for a wonderland of cotton candy and sparkling rainbows. 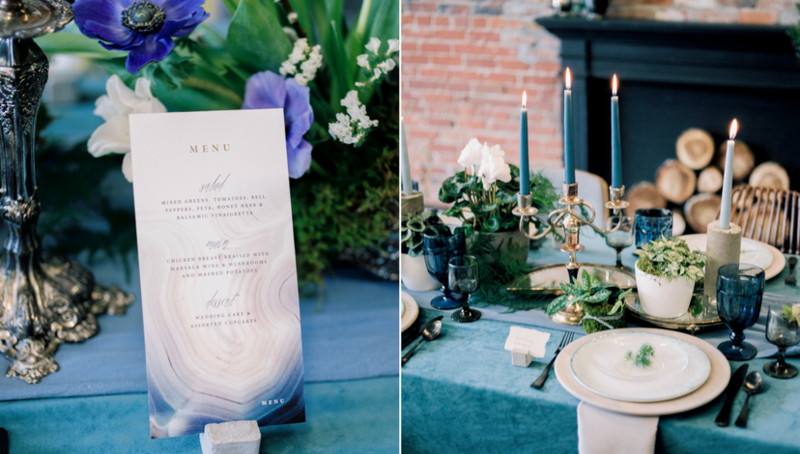 This equestrian-inspired soiree calls for dark tones and plenty of greenery. 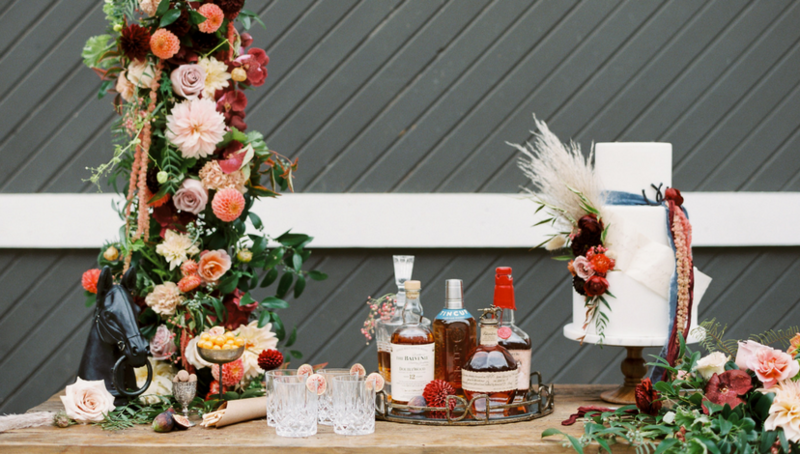 The mix of ribbons, feathers, and bar accessories make a big statement for this derby party. 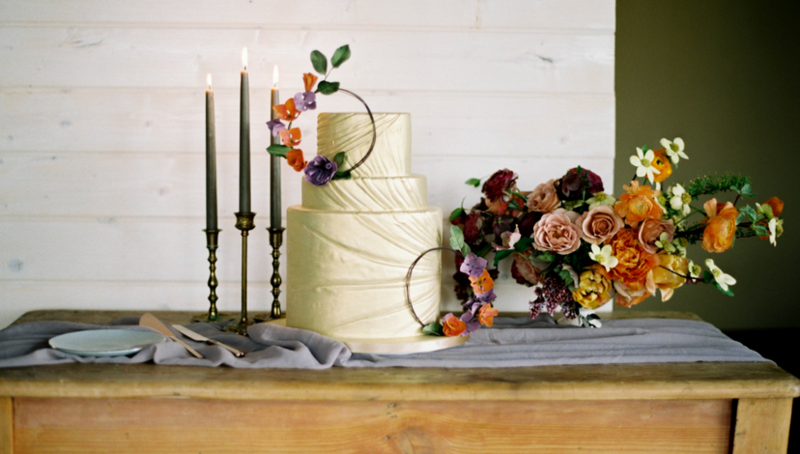 Add a simple table runner to your sweets table to highlight rustic wood tones of your cake table. While we’re here, let’s take a moment to appreciate the most perfect mini floral hoops on that cake! There is no such thing as too many florals. Especially during a spring wedding when there are so many in bloom! 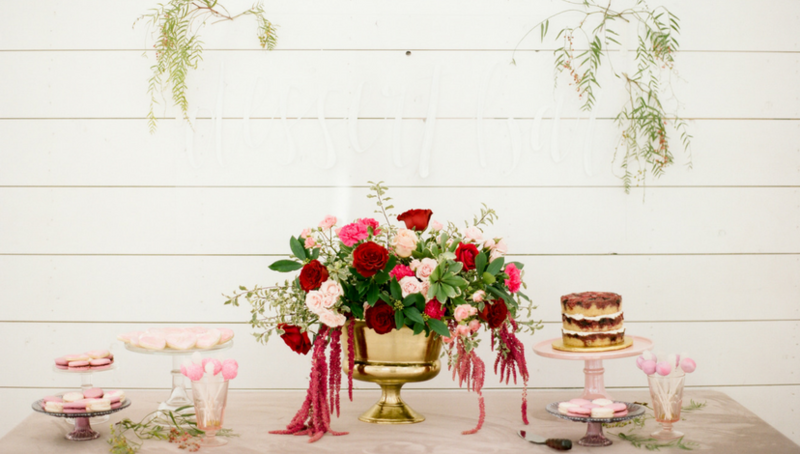 Dive into these weddings where the details and décor are the highlight of the event. Balloons are making a come back! Going beyond kids’ birthday parties, balloon garlands are the best way to add in a touch of whimsy. 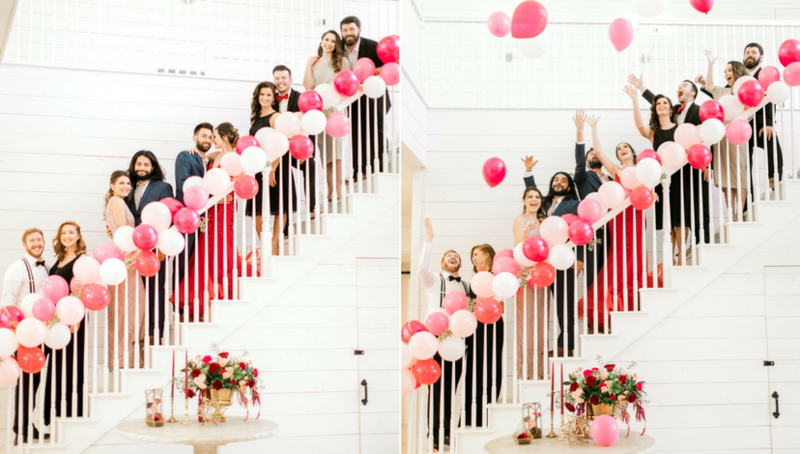 We absolutely love how bright and inviting this space looks by adding balloons to the staircase banister. 30. A Lot of Hoop-la! When designing a space, don’t neglect to decorate the walls too. Create vertical interest with hanging florals, taller centerpieces, or draping. 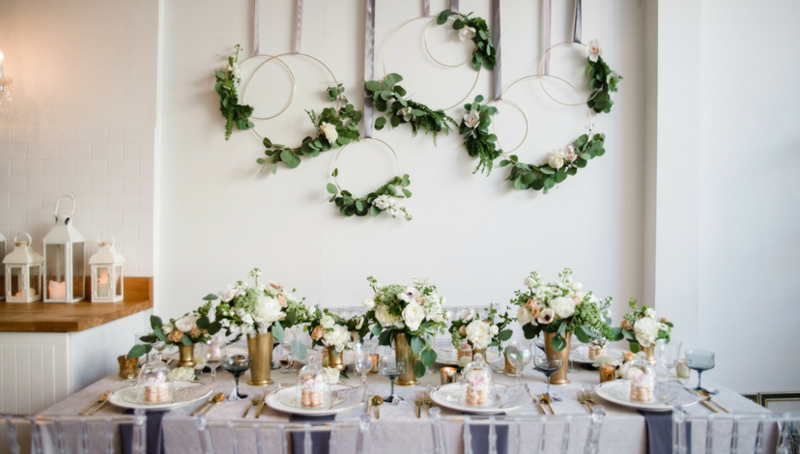 This look utilizes floral hoops to bring up the eye line, creating a larger decorative space. Add a personalized touch to your wedding with custom made place cards. 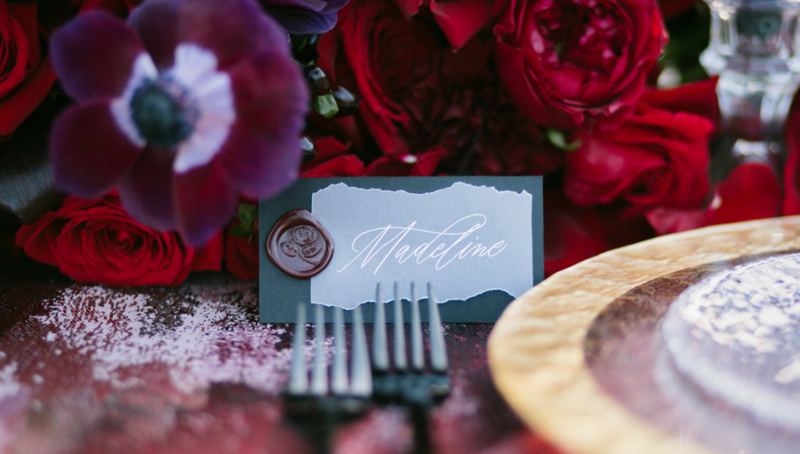 We love how this bride chose to go with maroon wax seals, delicately torn vellum, and black cardstock paper for a multilayered look. Match place cards to your accent colors for a cohesive look. Tie in metallic accents with coordinating ink. We love how the gold ink really stands out against the deep blue cotton deckled edge paper. We all know the phrase, “less is more,” but sometimes, more is better. 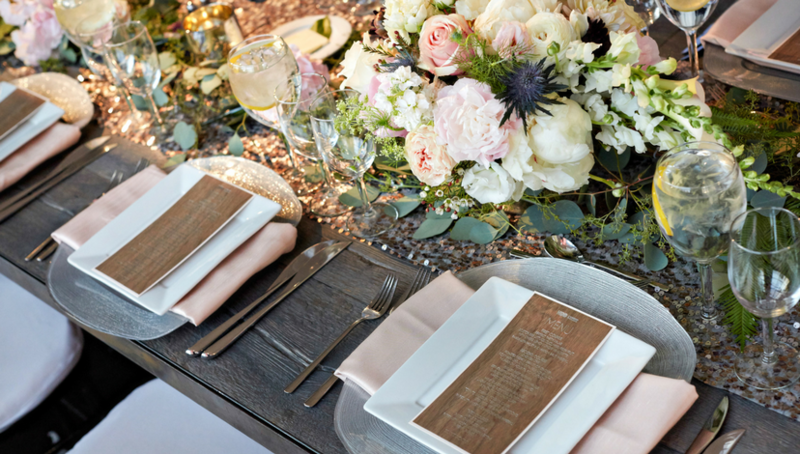 This table features warm earthy tones complete with patterned placemats, woven chargers, tri-fold menus, wooden salt and pepper bowls, beaded napkin rings, natural flower arrangements, and one massive tealight candle holder. Take “something blue” to a whole ‘nother level with this blue monochromatic look. Keep your table from looking too boring by playing with textures and patterns in the same color family. 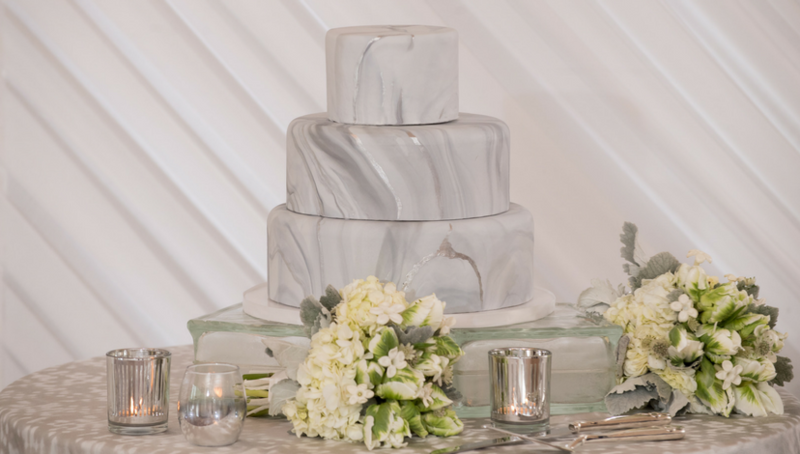 We love how these agate patterned menus play off of our Arctic Velvet table linen. 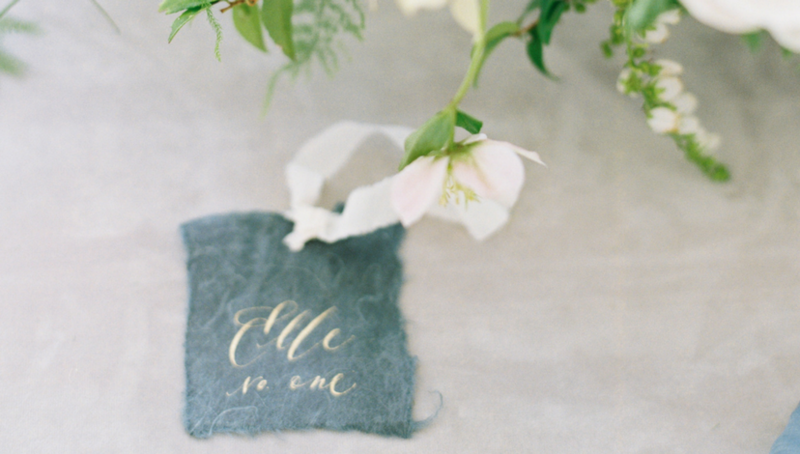 Who said place cards have to be on the table? 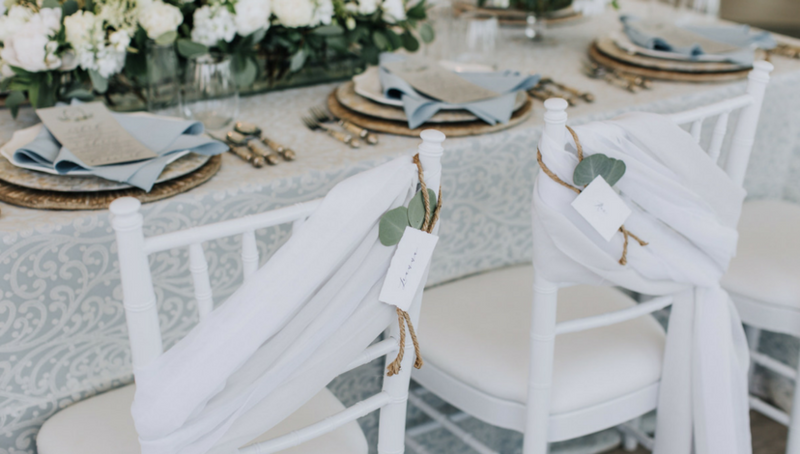 Hang place cards on chairs to add a layer of interest to sheer chair sashes. We love this simple but functional and unique idea. We’re thankful that spring is here and we’re ready to see 2018’s best spring looks.